At all new protective relay installations, the relays should be adjusted in accordance with the settings given in the relay data sheets, after which, tests should be made to determine if the actual operating characteristics check with the adjustments made. The Denver Office, Facilities Engineering Branch, must be advised of field changes of relay settings that become necessary from time to time as system operating conditions change to permit coordination with the Division of Design on future designs or revisions. Relays and relay settings are not to be changed from what is indicated on current issues of relay data sheets unless authorized by regional or project personnel with the proper responsibility. It is necessary to revise relay settings upward from time to time at many stations in preparation for anticipated increased unit output or line loading. At such times it may also be necessary to make corresponding changes in backup protective equipment in order to maintain coordination. Under these conditions, the changes in the backup relays should be made first so that coordination will not be lost during the period between beginning and completion of tests. This would apply whenever increased backup relay settings accompany changes in first-line protective equipment. One case has been brought to our attention where new settings were applied to line relays but, because of lack of time, the backup ground relay was not reset until the following day. In the meantime, a fault occurred on the line, and the entire station was interrupted because the coordination had been lost. If the backup ground relay had been reset before settings were changed on line breaker relays, this interruption would not have occurred. In a few rare cases relay settings may be revised downward at a station; and, in such cases, the opposite sequence must be followed in order to maintain coordination. When relay settings are revised downward, apply the new settings to the line breakers first and to the backup relays last. Before placing a new installation into operation, polarity of instrument transformers and the wiring to the relays should be checked. In some cases, the manufacturer’s polarity marking has been found to be incorrect. New relays should be inspected carefully and all blocking put in by the manufacturer removed. The test man should read instruction books furnished by the manufacturer to become familiar with construction and operating principle of the relays. A sufficient number of initial operations should be made by manually operating relay contacts to make sure that all devices which should be operated by the relay, function freely and properly, including auxiliary contacts and targets within the relay. Breaker trip coils and other devices operated by the relay should be checked to see that proper operation is obtained at voltages considerably below normal (approximately 56 percent of normal voltage for breaker trip coils). The voltage drop in trip circuits and tripping current required should be checked. Factory adjustments on relays, other than taps, or other adjusting devices intended for customary adjustment should not be changed unless tests show that factory adjustments have been disturbed, in which case the manufacturers’ instruction books should be followed. A good set of testing equipment and relay tools are important. Several manufacturers now produce portable relay test sets that will provided excellent results. If not available on the project, most of the equipment necessary can be borrowed from the Denver Office for making relay tests. Before starting to test any relay on equipment in service, the person testing should become familiar with the relays and the circuits involved. Where test blocks are used, the person testing must make sure that in removing or inserting plugs that a current transformer circuit will not be opened, resulting in a voltage being built up which may be dangerous to personnel, property, or equipment, or cause an important circuit to trip out. In old installations where test blocks are not available, current transformer circuits must be short circuited by jumpers having reliable clamping devices which will not come loose, before the relay current circuit is opened. It is recommended that protective and auxiliary relays be given a complete calibration test and inspection at least once a year. This schedule, however, sometimes cannot be met due to existing workloads and available manpower with the result that routine calibration tests intervals of many relays are longer than a year. A complete record should be kept of all test data and observations made during tests and inspections, including identifying numbers of test equipment used. A visual inspection should be made of all relays on a terminal including the tripping auxiliaries and accessories. Any drawout type relay should be withdrawn from its case for a closeup examination. All other, including auxiliaries, should at least have covers removed. Included in this visual inspection should be a check for loose connections, broken studs, burned insulation, and dirty contacts. Each relay should be checked to be in agreement with its setting sheet. On some distance relays it may have been necessary to set the taps on something other than specified values in order to get proper calibration. Because of this, it may also be necessary to check the taps against the last calibration test report. A test trip should be made of all relay systems. All relay elements which initiate some protective function should be checked. This includes reclosing, carrier starting, or any similar type function. After proving that tripping relays will successfully trip the circuit breaker and that all reclosing schemes work, continuity checks should be used, where applicable, to complete the checkout of the circuit breaker trip circuits. 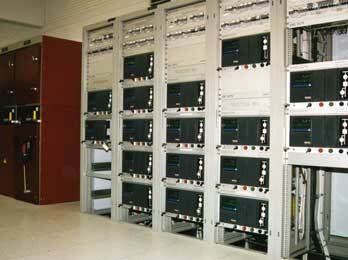 Tests to be performed during routine maintenance are determined by the type of relay to be tested. The following tests should be included for all electromechanical relays. A visual inspection of the relay cover can reveal valuable information. Any excessive dust, dirt, or. metallic material deposited on the cover should be noted and removed, thus preventing such material from entering the relay when the cover is removed. A cover glass which is fogged should be cleaned. Fogging is in most cases a normal condition due to volatile materials being driven out of coils and insulating materials, and is not an indication of a problem. However if fogging appears excessive, since most relays are designed to operate in ambient temperatures not exceeding 40EC (104EF), a further check of the ambient temperature would be in order. Voltage and current supplied to the relay should be checked and compared with the name plate or instruction book ratings. Should evidence of overheating be found, the insulation should be checked for embrittlement and, where necessary, replaced. Removal of the connection plug in drawout relays may reveal evidence of severe fault currents or contaminated atmospheres, either of which may indicate the advisability of a change in maintenance schedule. The condition of the relay contacts can be equally revealing. Check to see that all connections are tight. Several loose connections could indicate excessive vibration which should be corrected. All gaps should be checked that they are freeof foreign material. If foreign material is found in the relay, the case gasket should be checked and replaced if necessary. All contact or armature gaps should bemeasured and values compared with previous measurements. Large variations in these measurements may indicate excessive wear, and worn parts should be replaced. Also an adjusting screw could have worked loose and must be tightened. All of this information should be noted on the test record. All contacts except those not recom-mended for maintenance should be burnished, and measured for alignment and wipe. Since checking bearings or pivotsusually involves dismantling the relay, it is recommended that such a test be made only when the relay appears to be extremely dirty, or when subsequent electrical tests indicate undue friction. Contact function.-Manually close oropen the contacts, and observe that they perform their required function; such as trip, reclose, or block. Pickup.-Gradually apply current or voltage to see that pickup is within limits. The current or voltage should be applied gradually in order to yield data which can be compared with previous or future tests and not be clouded by such effects as transient overreach. Dropout or reset.-To test for excessfriction, reduce current until the relay drops out or resets. Should the relay be sluggish in resetting or fail to reset, then the jewel bearing and pivot should be examined. A four power magnification is adequate for examining the pivot, and the jewel bearing can be examined with the aid of a needle which will reveal any cracks in it. If dirt is the problem, the jewel can be cleaned with an orange stick and the pivot can be wiped clean with a soft, lint free cloth. No lubricant should be used on either the jewel or pivot. In addition to tests described in paragraph 9, auxiliary relays employing devices for time delay (for example, capacitors) should have an operating time test performed (either pickup or dropout, whichever is applicable). All tests described in paragraph 9 should be performed for time-overcurrent and time-over-voltage relays where applicable. These types of relays should always be tested in the case in order to duplicate “in-service” conditions or to match published curves since the relay case normally acts as a shunt for flux that the electromagnetic iron circuit cannot handle due to saturation. 0.5 time-dial position. Allowing for such things asmeter differences and interpretations of readings, this value should be within ± 5 percent of previous data. One or two points on the time-current curve are generally sufficient for maintenance purposes. Reset the relay to the original time-dial setting and check at two points such as 3 and 5 times pickup. Always use the same points for comparison with previous tests. The instantaneous unit should be checked for pickup using gradually applied current. Whenever possible, current should be applied only to the instantaneous unit to avoid overheating the time unit. The target seal-in unit should also be tested using gradually applied current. The main unit contacts must be blocked closed for this test. When testing distance relays, tests should be made of pickup, angle of maximum torque, contact gap, and clutch pressure, in addition to the tests described in paragraph 9. (See appendix C for adjustment of Westinghouse Type KD relays). A test of minimum pickup should be performed for differential relays. The differential characteristic (slope) should be checked, and where applicable, the harmonic restraint should be tested. Differential relays using ultrasensitive polarized units as sensing devices are slightly affected by previous history, such as heavy internal or external fault currents. It is therefore recommended that for this type of relay two pickup readings be taken and the second reading be the one that is used for comparison with previous and future tests. Static relays should be tested in accordance with manufacturer’s recommendations given in relay instruction books. As there are no moving parts in static relays, there is no physical wear due to usage and no need for lubricants. Prime causes of failure in electronic components are heat, vibration, and moisture. Overheating can be caused by voltage transients, current surges, excessive power, or high ambient temperature. Keep equipment clean by periodic vacuuming or blowing out of dirt, dust, and other surface contaminants. Keep the equipment dry and protectedagainst moisture and corrosion. Inspect to see that all connections, leads,and contacts are tight and free as possible from effects of vibration. Check to see that there is adequateventilation to conduct heat away efficiently. Preventive measures should not be applied unnecessarily as this may contribute to failures. For example, printed circuit cards should not be pulled from their racks to be inspected if there is no real need. Operating test switches unnecessarily may introduce damaging voltage transients. Particular attention should be given to relays mounted on portable relay panels as these relays are subjected to more rough handling than those permanently installed on a switchboard. Therefore, whenever a portable panel of relays is installed, they should be thoroughly checked physically as well as electrically. If they are in bad condition, they should be repaired, or new relays installed before they are placed in service. When CT circuits are modified such as by addition of relays, meters, or auxiliary CT’s, measurements should be taken to determine the burden of the overall CT secondary circuit. These measurements should normally be on a phase-to-neutral basis. Measurements should be made at three current levels, such as 1, 3, and 5, while recording volts, amps, and phase angle. When auxiliary CT’s are involved, additional and separate measurements should be taken on the secondary circuit of the auxiliary CT’s. Auxiliary CT’s tend to saturate at much less secondary current and burden than large multi-ratio bushing type CT’s. Excitation curves should be available on all CT’s, especially on auxiliary CT’s used in protective relaying circuits (fig. 1). Such curves can be derived by open-circuiting the primary, and driving the secondary with a 60-Hertz source while measuring voltage and current. Readings should be taken up to two times rated secondary current or to the point where voltage applied is 1500 volts. The CT and PT circuits should be grounded at only one point. Relay misoperations can be caused by grounding the neutral at two points, such as one ground at the switchyard and another at the relay panel. At least once every 3 years with the primary deenergized, the known ground should be removed and the overall circuits should be checked for additional grounds and insulation breakdowns. WARNING: Secondary circuits of CT’s must not be open while primary current flows. Extreme care should be taken to avoid breaking the secondary circuit while primary current is flowing. If the secondary is open-circuited the primary current raises core flux density to saturation and induces a high voltage in the secondary which can endanger human life, and can damage connected apparatus and leads. If it is necessary to change secondary conditions while primary current is flowing, the secondary terminals must be short-circuited while the change is being made. Caution should be exercised when working with differential circuits as shorting a current transformer in an energized differential relaying circuit could result in a relay operation. It is recommended that the secondaries of all current transformers be kept short-circuited at all times when not installed in a circuit such as being held in stock or being transported. Temperature relays used on bearings and for other important purposes should be checked for correct operation by placing the bulb in a pail of water with a thermometer, and gradually heating to the temperature at which the relay is set to operate. A mercury or alcohol thermometer should be used to read the temperature while the water is being stirred. Record temperature at which the relay operates on increasing temperature and at which it resets on falling temperature. Temperature relays operating from RTD’s (resistance temperature detectors) should be checked by heating the detectors slowly in an enclosed air space since they should not be immersed in water or other liquid. Pressure relays should be checked for correct operation by comparing with an accurate pressure gage. Pressure should be increased and decreased to determine the pressure at which the relay operates and resets. The above does not apply to sudden pressure relays, which should be maintained in accordance with the manufacturer’s recommendations. and welcome in a room. The spacing of studs determines the energy efficiency of walls. to educate themselves to better negotiating a pricing with contractors. If you have work that needs to be done in the house, you will need to consider their schedule. It means that you will have to refinance into a home rehab loan.